Today might mark the first day of spring, but the weather in Minnesota has proved to be more like summer lately. Highs in the 80's and "lows" in the 60's? If this is global warming I don't know that I can honestly complain. I love it! This past week, with temperatures that felt as though we were on vacation, Todd and I immediately pulled out the patio furniture and grill... then made the most of it. There is just something lovely about grilled vegetables. *Note: I prefer to use the glaze because it's dramatically thicker with more flavor and sticks to the skewer (in a good way!) I am in no way affiliated with the Gia Russa company but I really enjoy this glaze. If using wooden skewers, soak them in water for 20 minutes. In a small bowl, combine balsamic glaze, olive oil, cayenne pepper, garlic powder, salt, and pepper; mix well. 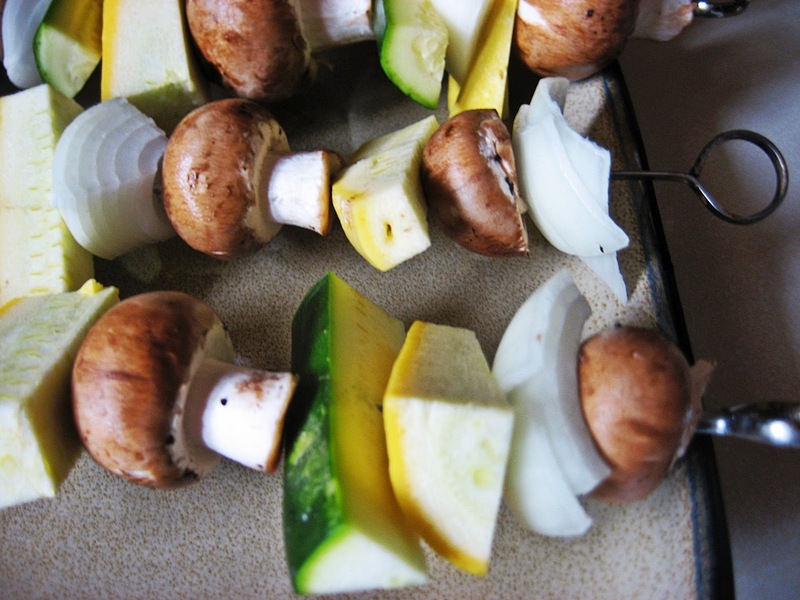 Alternately thread 2 chunks each of yellow squash, onion, green pepper, and zucchini, and mushrooms onto each skewer. Place skewers on a 10- x 15-inch rimmed baking sheet and pour oil-and-vinegar marinade over vegetables. Marinate for 30 minutes, turning after 15 minutes. Preheat grill to medium-high heat and grill kebabs 8 to 10 minutes, or until fork-tender, basting occasionally with marinade.